Nicotinic acid is a vitamin PP or B3. This drug is prescribed to improve lipid metabolism, lower cholesterol, etc. Nicotinic acid often is assigned a two-week course, stabbing it at the same dose throughout a course or in a specific pattern. For the treatment of various diseases recommended by different duration and course doses of nicotinic acid. So in the treatment of pellagra (a disease of metabolism resulting from a lack of vitamin PP) prescribe the maximum rate of this drug. In pellagra intravenous-drip 2-4 ml of nicotinic acid, dissolved in 200 ml of isotonic solution. I.e., 200 ml bottle with 0.9% sodium chloride solution type doctor's prescription from 2 to 4 ml of nicotine and connect the patient with the IV induced solution. In severe cases I. V. nicotinic acid is put on twice a day – morning and evening. Treatment on prescription is 10-20 days. Liver diseases and pathology of the gastrointestinal tract (peptic ulcer, gastritis of different etiology) nicotinic acid administered 0.5-1 ml subcutaneously or intramuscularly. For intramuscular administration of the drug to adults people need to use the needle that comes in the kit with a syringe volume of 5 ml And needle, which comes complete with a 2 ml syringe, is more suitable for intradermal injection of the solution. The course of treatment according to doctors ' recommendations is 7-10 days. Under these diseases, it is desirable to repeat the treatment nicotinic acid 2 times a year, prior to the period of seasonal exacerbations, i.e. in September and March. 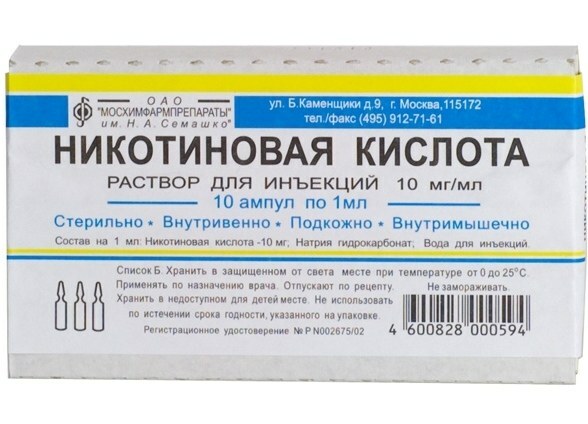 To improve metabolic processes in the organism in mild forms of diabetes, atherosclerosis, hyperlipidemia, and to reduce spasms of peripheral vascular occlusive disease, migraine, Raynaud's disease, etc., injections of a solution of nicotinic acid it is recommended to inject intramuscularly according to a certain scheme. Start with small doses – 1 ml, then adjusted to a maximum single dose of injection of 5 ml, then the dose is reduced. Thus, in the first day of treatment is necessary to introduce 1 ml of vitamin B3, the second 2 ml, the third – 3 ml, in fourth – 4 ml, on the fifth day you enter a maximum dose of 5 ml, and of the sixth day begin to reduce the dose, i.e. on the sixth day – 4 ml, in the seventh – 3ml, eighth – 2 ml, in the ninth day of treatment you inject 1 ml of nicotinic acid. Always keep in mind that nicotinic acid is a vitamin, so to perform the injection with her solution is better after a meal, because the acid binds with other nutrients and shifts in the compound nicotinamide, which is very valuable for the body, as involved in lipid metabolism and normalizes the level of cholesterol in the blood. Like many vitamins, nicotine causes pain when parenteral her administration. If you own a technique of intramuscular injection and will inject vitamin PP by yourself, try to inject the drug very slowly to reduce the painful feeling from the injection.